Max Corona, an engineering manager in Colima, Mexico wrote in to tell us about his two Nautel J1000's, a V5 transmitter and his recent purchase of two VS2.5 transmitters. Previous to purchasing Nautel’s solid state transmitters, I installed transmitters with bulbs, which created a lot of problems with repairs and working at high voltages. These days it’s different and my story with Nautel has been excellent. Imagine my surprise when I received the Nautel Jazz 1000 solid state transmitter without transformers, without bulbs, a quiet, clean operation and very few problems. 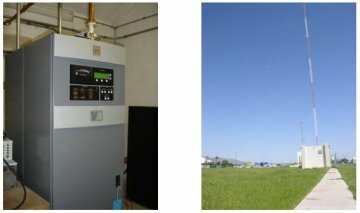 We have two J1000 transmitters, both purchased in December, 2006 and located at XEMAX and XERL transmitter stations in Tecomán and Colima respectively. Also, I love my Nautel V5 located at the XHZZZ transmitter station in Manzanillo and purchased in January, 2007. It initially had some problems with the modules but the people at Nautel’s Customer Support – particularly Nelson Bohorquez – were very responsive, looked after me very well and my issues were quickly resolved. We are currently experiencing a change of frequencies in the AM and FM, and have decided to buy two new Nautel VS2.5 transmitters which I’ll receive shortly. Max Corona's Nautel V5 at XHZZZ, Manzanillo (left). The XEUT site in Tijuana which houses the Nautel XL-12 (right). Miriam Guirado, an electronic engineer in Tijuana, Mexico wrote in to tell us about his Nautel XL-12. I’m in charge of a Nautel XL-12 purchased in 1998. We transmit in the 1630AM, from 6AM to 12AM, at the University Radio System of the UABC (Universidad Autónoma de Baja California, Campus Tijuana). My first experience with Nautel, was on a cold, rainy day, when the transmitter shut down because of the up’s and down’s in the AC lines. When I saw the little building where the transmitter was, I was speechless! Under the door of the transmitter room was heavily flowing water. The CFE (Federal Commission Energy) registers, which are 1.5m x 1.5m cubes of concrete connected to 220V AC cables, were in water, and the lowest register in the water was ours! I have to say, the Nautel XL-12 is a very noble, reliable and powerful transmitter. I’ve been working with it almost six years now, wow! It feels like less. I love that the Nautel XL-12 is solid state! XEUT Tijuana 1630 AM is perhaps the best known of these Mexican stations internationally because of its wide coverage on this higher AM channel.